Many people wish they could remove bulk from their hair. The bulk could be caused from extra-thick hair, course hair or frizzy hair. 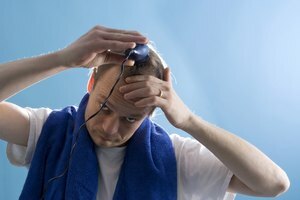 It could also be caused from a bad haircut, which places more hair in some areas than others. To remove bulk yourself, try at-home remedies that smooth and de-frizz your hair naturally. To remove bulk through a haircut, multiple methods of cutting and styling hair are available for you or your hair stylist to try. Before showering, apply a thick coat of mayonnaise to the hair and let it soak in for 30 minutes. Once you wash your hair, this treatment make the hair appear thinner. Use hair products in the shower that claim to smooth hair completely, such as shampoos and conditioners that are labeled "skinny." After the shower, soak excess moisture out of your hair with a towel. Then, apply a smoothing milk product or de-frizzing gel. Comb the product through your hair evenly, from roots to ends. Allow the hair to completely dry, while continually combing the hair. If using a blow-dryer, brush the hair downward while drying. Use a straightener or curling iron to flatten the hair more and remove any frizz that is still visible. Spray the finished product with hairspray, to keep it in place. While the hair is wet, cut the ends of the hair with a beveled razor, in a downward angle. This will lightly add layers to the hair, but at an angle that suits the texture and density of your particular hair. Cut the underneath layers, sometimes up to the scalp. This will thin the hair for a period, until the hair grows back. Once the hair is dry, use thinning shears, which are "combs" with jagged blades that are used to cut hair randomly to create a natural appearance. 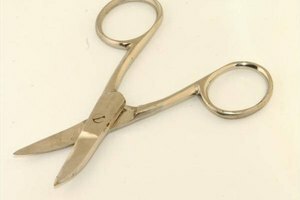 For long hair, use multiple snips per section. For short hair, one snip per section is enough. Fine, evenly shaped combs cut at least one-third of hairs and are good for long and straight hair. Thick combs are better for curly hair or for choppy, textured cuts. First try the home methods to see if you can smooth out your hair with products and styling. If you still are not satisfied, visit your salon for removal of the bulk. Try one salon method at a time to see which works best with your hair and condition.